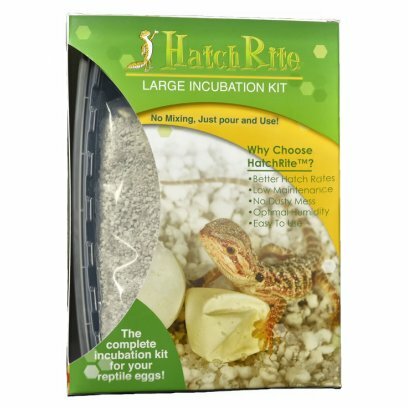 Hatchrite was devise by a dedicated reptile enthusiast with over 30 years experience in successfully incubating the eggs of lizards, snakes, turtles and tortoises. 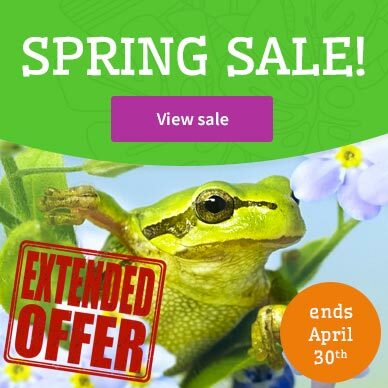 It's unique formulation is superior to all other commercial incubation media for reptiles because it maintains optimal humidity and moisture conditions for significantly longer, with much less maintenance. 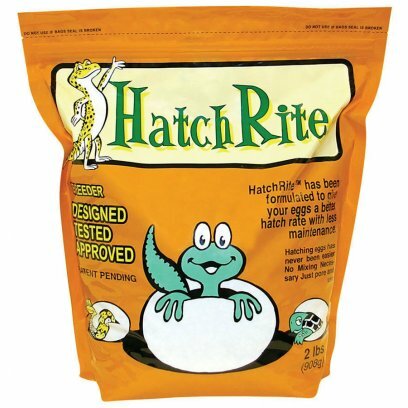 Hatchrite is premixed with water and imediately ready to use, which takes the frustration and guesswork out of preparing water to medium ratios used with other incubation media. 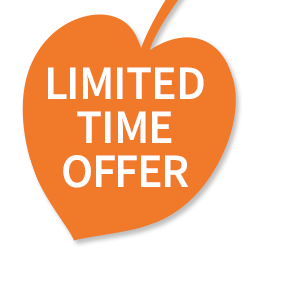 Plus, HatchRite is dust free, and non-toxic, which means it's safe to use with children and family pets. 29cm x 21cm x 7cm deep. 18cm x 12cm x 5cm. 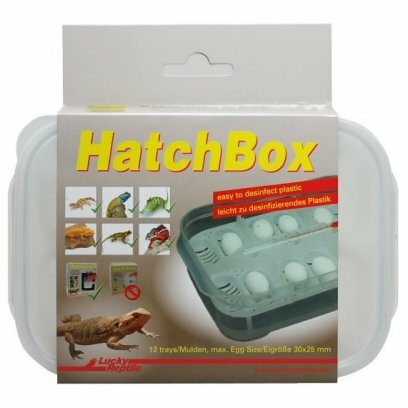 The Lucky Reptile Hatch Box is a true marvel of incubation technology. Simple and efficient. 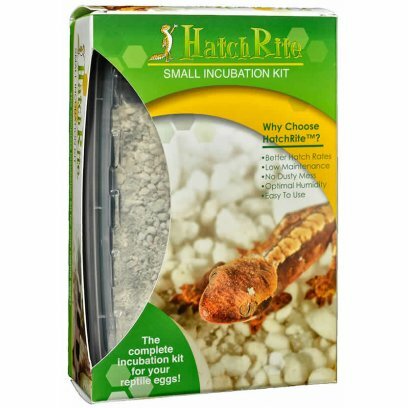 This reptile egg incubator has been specially adapted to the Lucky Reptile Herp Nursery II. Ten Lucky Reptile HatchBoxes fit into the Herp Nursery II and each of the HatchBoxes can hold up to 12 eggs. The Hatch Box is equipped with a thermometer that allows you to monitor the temperature of the reptile eggs at any time. This measure not the temperature in the incubator or the average temperature, but the temperature of the eggs themself. The real difference with other incubation boxes however, is the substrate-free incubation method. This is not only very hygienic, but also prevents a moulding of the eggs. Lucky Reptile states that by incubating over water (the box consists of an egg insert over a shallow bowl filled with water) there is a steady and sufficiently high humidity. The Lucky Reptile HatchBox is made of a tough and easy to clean plastic. Our SuperHatch is an advanced incubation medium that allows easy moisture monitoring (it changes color) and is indefinitely reusable. Great for Gecko Eggs. INFORMATION: A This is a course grade ceramic product (Calcined Clay). It has excellent porosity and is the next generation in egg incubation media. It does not break apart over time, does not compact, or float. It?s color changes based on the amount of water it contains so you can easily monitor visually for changes in moisture level. It can be re-used indefinitely by cooking or boiling to sterilize. An inert, neutral, 100% natural mineral blend, this product lasts year after year without breaking down. Each particle contains thousands of internal and external pore spaces. DIRECTIONS: Place SuperHatch in a sieve, strainer, or in a porous bag. Soak in water for a few minutes, remove and let drip dry. Add SuperHatch to your incubation container, filling it approx. 1/2 full. Add eggs, and you are good to go! Saturating the SuperHatch and letting it drip dry is a suitable mixture for most species. 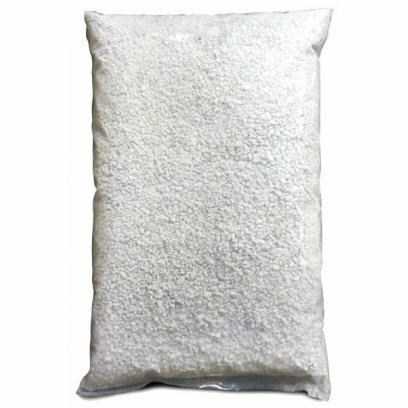 Some species require less moisture in the container, and this can be easily accomplished by taking the saturated SuperHatch and mixing back in a % of dry SuperHatch. You can also mix SuperHatch with Water on a weight/weight, or volume/volume ratio to get the required moisture level. 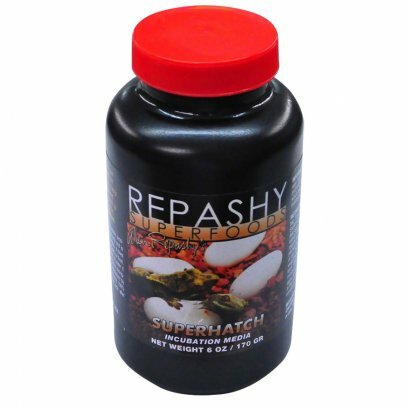 SuperHatch has extreme porosity combined with very fine internal structure size. This allows SuperHatch to absorb and hold large amounts of water, with a very slow rate of evaporation, which helps control the quick release of water which causes surface moisture and condensation. Always use the largest feasible incubation container possible. A minimum recommended size is a 16 oz container for a pair of gecko eggs, and a shoebox size container for 10-20 eggs. The more volume in the container, the last drastic environmental changes can effect the conditions inside the container. 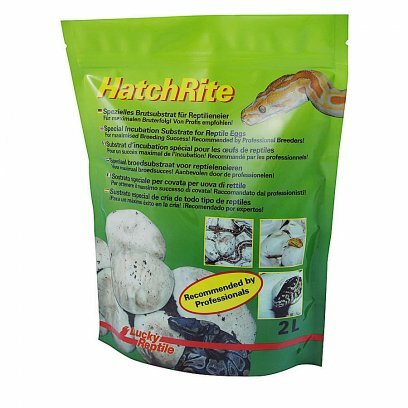 When incubating eggs we generally recommend vermiculite or pearlite (hatchrite) as they retain a lot of moisture and are great for increasing humidity without soaking the eggs. If you are unsure on how to incubate your eggs or need advice on which unit you need or how to set it up please call use on 01604753823 and we can talk you through it. 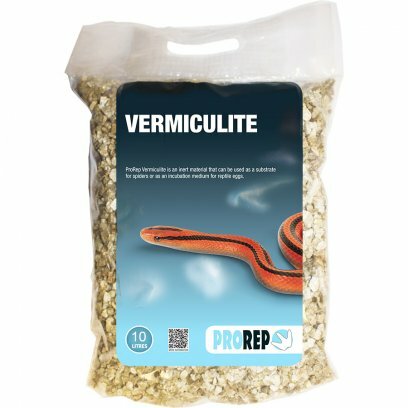 Vermiculite can be used as a substrate for spiders or as an incubation medium for reptile eggs. A 100% natural substrate made from exfoliated volcanic rock, it is inert and will not decay or go mouldy.